The breast implants are placed through a small cut or incision in the armpit. The incision is usually about 1 inch in length and is hidden deep in the armpit. The incision normally heals well and is barely noticeable and its appearance is similar to an armpit crease. Because the incision heals so well and is hidden, women continue to wear all styles of clothing including sleeveless dresses and tank tops. With the armpit incision, the breast implants are usually placed under the pectoralis muscle with the use of an endoscope. 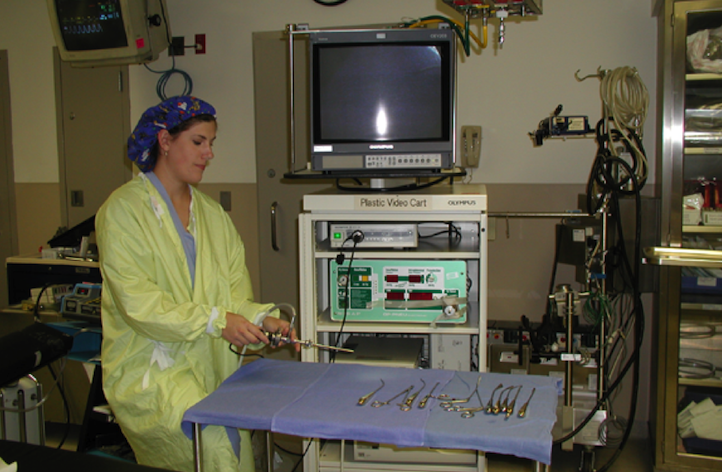 The endoscope is a long thin tube with a camera at the end to allow Dr. Lo to visualize the pocket and place the breast implant properly. Should my implant be placed behind or in front of the muscle? The pectoralis muscle is the large muscle between your breast and your chest wall that attaches to your upper arm. With the armpit incision or transaxillary breast augmentation, the implant is placed behind the muscle (pectoralis). This give a natural smooth look, decreases the chance of scar tissue (or capsular contracture) and makes mammograms easier to read. With placing the implant behind the muscle, your muscle will not be damaged and your strength will be the same. Dr. Lo does not recommend placing the implant in front of the muscle or subglandular with the armpit cut. Dr. Lo, I have a tendency to form bad scars. I have cuts on the rest of my body and from surgery, and the scars did not heal well. Is transaxillary breast augmentation recommended for me?